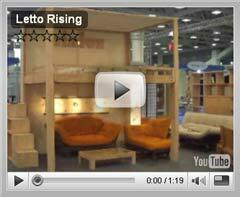 In Japan an elaborate mat takes the place of the bed, table, chairs, sofa and armchairs. It's called a TATAMI and is used by the Japanese to cover all the floors of the house. Tatamis are filled with rice straw stubble which is evened out, interwoven and tied with a strong cord, creating a thickness of approximately 6 cm. The outside is then covered with rush matting. The edges are squared with extreme precision and the two longest sides are edged with a wide border of black linen or cotton. In the homes of the nobility, decorative black and white motifs are woven into the borders. The softness of the Tatami muffles every sound and when you walk on a Tatami it yields slightly to the pressure of your bare foot; the Japanese take off their shoes at the front door. In spring, during the first sunny days of the year, Tatami are taken outside and aired, stacked in pairs like playing cards. People eat, sleep and die on Tatami; they are bed, chair, armchair and sometimes even table. At night the Futon is laid out on the Tatami with a quilt for a cover and the bed is ready. In the morning, these objects are hidden away in a big closet and the peaceful atmosphere typical of Japanese homes returns. Tatami are the typical flooring of traditional Japanese homes. They are composed of three parts: the "toko" core, very carefully packed with rice straw stubble which is carefully evened out and then tied with a cord, creating a thickness of approximately 6 cm and a weight of around 30 kg; "omote", the visible outer layer is made of "igusa" rush matting which can be refined to varying extents. The best quality straw is long but mechanical harvesting equipment cuts the straw into too small pieces, so it has to be imported from Taiwan. The edges of the mats are squared with precision, so as to allow the mats to be flanked or lined up with greater ease, and the two longest sides have "heri" borders in linen or cotton, which are usually black. In the most prestigious homes, tatami can also be found edged with different fabrics and decorated with stylized symbols or ideograms, such as the chrysanthemum, one of the symbols of Japan. Handcrafting of Tatami is entrusted to specialists, some in the production of all of the three parts, others who specialize only in the assembly or finishing process. In some areas of Japan it's not unusual to see craftsmen outside their front doors, crouching by a low frame for manufacturing mats, weaving and tying the rice straw, or working on the finishing of the mats. Tatamis are composed of entirely natural materials and are therefore an environmentally friendly and fully biodegradable product, while offering maximum comfort. Tatami's unique feature is that they adhere to surfaces without the use of glue, and provide significant thermal and acoustic insulation. The compact surface yields slightly to pressure when walking barefoot or in Tabi (traditional Japanese socks with separate toes), causing a pleasing sensation of contact with the ground. Shoes are left outside the room to avoid offending the place and the people who live there. Over the course of time Tatami have become units of measurement, and architects always design rooms to contain a certain number of Tatami mats. The interior of the house is not meant to protect people from nature but to integrate with it in complete harmony and balance. Zen Buddhist monks in the Muromachi and Momoyama periods formulated and expressed this ideal so well that the whole of Japanese society aspires to follow it. The result are environments that seem to speak to the spirit and instill calm and balance. Minimalism and simplicity are the characteristics that zen philosophy has passed down to traditional Japanese interiors. This effect is achieved through the rhythm of vertical "shoji and fusuma" panels and horizontal Tatami, precisely matched to natural materials and colors. About the same time as Leonardo da Vinci developed his measurement system based on the proportions of the human body for use in architecture, Japanese craftsmen and builders standardized the size of Tatami. As a guideline, the size of a Tatami mat corresponds to the space taken up by a person lying down. The most common sizes (although this varies from province to province) are 90 x180cm and 85 x 180cm. There are also half-tatami which are 90 x 90 cm or 85 x 85cm. Rooms with flooring of this type are called "washitsu", while western-style rooms are known as "yoshitsu". In spring, during the first sunny days of the year, Tatami are taken outside and aired, stacked in pairs like playing cards. Tatami is a natural product made of rice straw. Although the rice straw itself is not a food-source for any animals or insects, over time, dust and our very own skin cells can deposit on the Tatami, becoming "food" for mites and insects. It is therefore necessary to clean the Tatami with a vacuum cleaner on a monthly basis, and to move the mattress to allow the Tatami to air. To clean the Tatami and remove insects or mites, wipe with a cloth soaked in a solution of five parts water and one part vinegar, or spray with pyrethrum-based ecological pesticide. The mattress on the Tatami mats require frequent airing (at least once a month) to prevent dampness that can occur in wetter months or be caused by sweating; this allow the Tatami and the mattress to breathe. Turn the mattress over so that the side that was in contact with the Tatami can "breathe"
Cinius is not liable for any defects arising from the failure to observe these instructions and will not be able to offer cancellation, price reduction, replacement or repair of the goods in this case. Some historical notes will help us to better understand how the Tatami mat evolved over the centuries. The origins of Tatami date back to the "Nara" period in the 8th century, and are attributed to Emperor "Shomu", who slept on a straw mat. Only from the second half of of the "Heian" period did the practice, especially in the presence of an illustrious guest, of unrolling round "Enza" mats to sit on become widespread, and then, until the 15th century, of using long "Goza" mats to sleep on,. 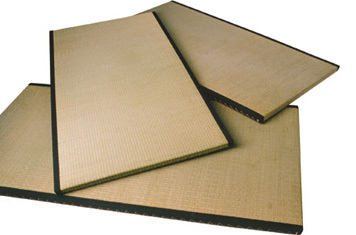 The name Tatami was already in use during the "Heian" period, and referred to mats which could be folded and stacked. The name derives from the verb "tatamu" which means precisely this. It was during the 16th century "Muromachi" period in the "Bingo" domain (in what is now Hiroshima Prefecture) that the use of raffia stalks to interweave the tatami was introduced. For a long time "Bingo"'s rulers sought to keep Tatami production techniques a secret, and it was not until the end of the "Meiji" period in the 19th century that tatami were disseminated and used in the homes of ordinary people, becoming the object we know today. A combination of the Emperor's mat, the "enza" with its comfortable padded "zabuton" cushion and the "goza" with a comfortable "shikibuton" or "futon" mattress unrolled on the Tatami. The use of Tatami spread beyond the dwellings of the nobility, into religious buildings, Buddhist and Shinto monasteries and temples Having taken on the form we know today, Tatami had to resist the attacks of modernization, which turned the rules of building, furniture and living space design upside down. Modern Japanese people are trying to keep the tradition of Tatami alive, setting up at least one room of their house with Tatami mats, which become the central element of the home. Through their inimitable and pleasant scent and their soft and relaxing color, Tatami spread a warm and serene atmosphere throughout the home. Tatami are a constant accompaniment to individual and family life: meals, traditional tea ceremonies, social relationships, prayer, love and even death. The use of Tatami is recommended to anyone who wants to turn their house into an oasis of calm, rediscover the pleasure of walking in contact with nature without sacrificing but rather increasing, aesthetic style and comfort and use natural, ecologically-friendly products. According to philosophical thought, Tatamis are not just a physical place but a gateway to awareness, a chance, even in small spaces, to expand your space. The growing trend for architects to make houses not dormitories but alive and open spaces makes the choice of Tatami almost obligatory, proving a starting-point for designing spaces, in terms of both cost and materials.